Nikita Sergeyevich Khrushchev (15 April 1894  – 11 September 1971) was the leader of the Soviet Union after the death of Joseph Stalin. He ruled from 1953–1964. Nikita was born in the town of Kalinovka in Russia. He later moved to Ukraine. He worked in mines, and became part of the Bolshevik movement. He was a political commissar in the Red Army in the Russian Civil War and again in World War II and moved his way up in the Communist Party, eventually becoming trusted by Joseph Stalin. When Stalin died, Georgy Malenkov and several others including Khrushchev shared power. Eventually Khrushchev became the leader. He died of heart disease on 11 September 1971. When Nikita became the leader of the Soviet Union, he began something he called "De-Stalinization". He made a secret speech, in which he denounced Stalin as a man who committed many murders of innocent people. In early 1956, he took down all posters and statues of Joseph Stalin. Also, he moved Stalin's grave to a place where people could not see it. He also had better contacts with the western countries like the USA, Britain, and France. This means the USSR and the western world were friendlier. He visited America in 1959. During this visit, Khrushchev spoke at the United Nations and visited where he wanted, including destinations such as New York and Hollywood. However, his visit to Disneyland was cancelled for security reasons. But the USSR and the US still did not trust each other. In 1962 America and the USSR had a Cuban Missile Crisis which could have led to nuclear war but didn't. 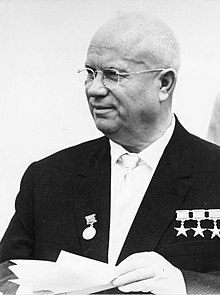 Khrushchev had bargained with the Americans to get rid of the missiles they had placed in Turkey, for the missiles in Cuba were the only way for withdrawal. Also, during this time, the Soviet Union became a lot less friendly with China. Because the Chinese leader Mao Zedong liked Stalin, he did not like it when Khrushchev became friendlier with the west, and when Nikita Khrushchev began a "destalinization" campaign. ↑ Tompson 1995, p. 2. Soviet era reports list his birth date as April 17 (April 5 old style) but recent discovery of his birth certificate has made biographers accept the April 15 date.